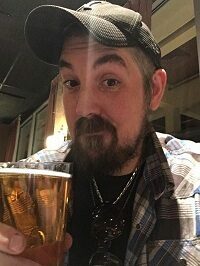 Described by both press and colleagues as an "independent renaissance man" and "voice of the underground," among other things, Dave Harlequin is a professional screenwriter, journalist, author, and independent filmmaker from Charlotte, North Carolina. Harlequin is the Creative Director and Lead Screenwriter of independent film collective A Stranger Concept Films and has won over two dozen awards throughout his filmmaking career. In addition to his film work, Harlequin is also the Editor in Chief of Nerd Nation Magazine, has over a dozen published short stories, dozens more non-fiction published credits, and has been nominated for two Rondo Hatton Awards for his journalistic contributions. Outside of his career in entertainment, Harlequin is an avid hockey fan and beer aficionado, and enjoys cooking, coffee, gaming, and hanging out with his dog.